Why does a normal sized, healthy and generally fit woman, young or older, try to fit into a size zero to feel like she is something of worth? Is zero the only beautiful now? How healthy can zero be? Do high fashion models who look like they barely live on lettuce and celery, simply black coffee, water and air, or just on drugs, look like healthy winners? I’ve seen some models in some ads relatively lately and YIKES they look like skimmed over skeletons! Where’s the fleshiness on their frames? They are simply sinew and skin on bones. Chubby, pudgy, curvy, pear-shaped, chunky, hefty, cuddly, pleasantly plump, cozy, well-rounded, hourglass, pillowy and healthy. All these words could fit into the term of today: plus sized. Is anything more than the sticks and bones of a fashion doll or model not acceptable as beautiful nowadays? Are women really expected to fit into a twig of a mold to fit into our modern society? 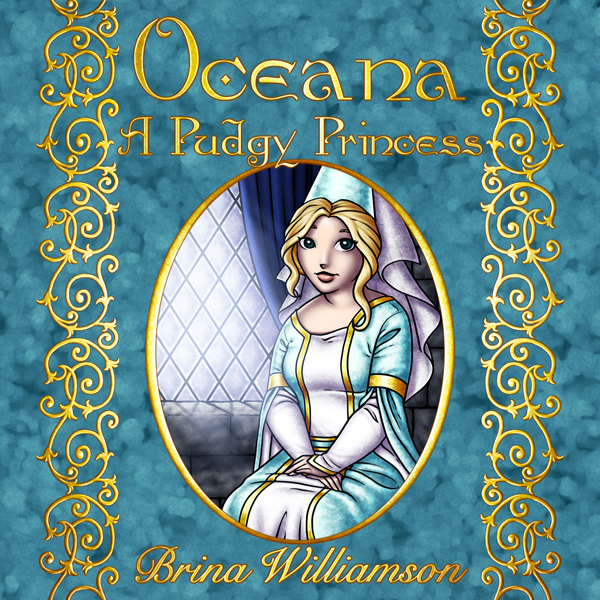 It was this kind of complaining from me about the typical princess being way too thin that instigated the beginnings of a pudgy princess who was ultimately named Oceana. What follows is my fairly recent review for my daughter’s book on Amazon. As the mother of the writer/ artist and assistant artist of this work, I confess as disclaimer to possible bias, though I do try to stay objective regardless. Cute is cute, wherever it comes from. I simply thought that some readers might like this `in house’ perspective, if only for the interest of it. As follows is how the story goes, or more precisely, how the story started. One day, I only off-handedly remarked to ears near in my household that `the world needs a plus-sized princess and somebody should create one’, because, `What’s the deal with all the skinny princesses?’. Unbeknownst to me until later that day, my daughter Brina marched herself upstairs to her room and promptly sketched in a story about a chubby princess. When she presented it to me, I was all cheers and a few happy tears too. I thought the story adorable, and a good `second opinion’ to help with body image health in girls and women alike. Of course, healthy fit and trim is good. Healthy is goodly, whatever shape it takes. It’s just that beauty is in the eye of the beholder, and some beholders think that other than skinny is beautiful too. As for myself, it’s the person inside that counts for everything, and the outward appearance ends up meaning next to nil in the long run. And then Brina’s darling drawings began to take curvy shape too. With help from my daughter Anna, many lines, colorations, shadings and highlights later, Oceana was ready for her `coming out party’ and I couldn’t be prouder of her than if she were my very own daughter. Well, I suppose she is my granddaughter of a kind. Anyway, I am a great fan of this pudgy princess and I hope she will find many more deserved friends. Romantics will be pleased to know there is true love in the end for Oceana. If you believe like I do that you can’t judge a book by its cover, I’m quite sure you will enjoy this little cuddly story.